A metal factory worker is planning a spending spree but warned off gold-diggers today after insisting his £71 million EuroMillions jackpot win - the 15th biggest in UK history - will change his life. 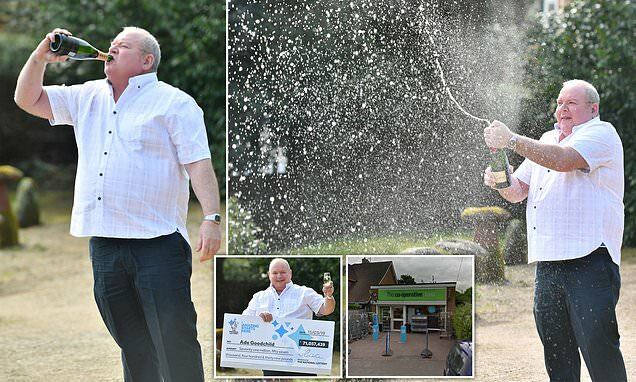 Ade Goodchild, from Hereford, has his eye on a new house with a Jacuzzi, 'a few staff' and dream holidays to the Grand Canyon and the Pyramids after claiming a prize of £71,057,439 following Friday's EuroMillions draw. Mr Goodchild, who is single and has now quit his job, was asked by reporters if he thought the money made him a more 'attractive' romantic prospect. He replied: 'Anybody I think I couldn't have pulled before has got no chance. He said he celebrated his win by watching the Wales v Ireland rugby match on television with his parents while sharing a takeaway pizza and spicy chicken wings, all washed down with Italian beer.